For three nights last December the School audience watched a play which, to say the least, made a strong impression. This may be a rather vague statement and subject to misinterpretation so we will consider it from two angles. I gathered from many of the audience afterwards that they had considered it one of our best productions. From a dramatist's point of view, however, it was meagre in places. Since it was a comedy and the first time that our Producers - Messrs Crawford and Tufnell had attempted one, it was by way of being an experiment. The most difficult part, on the part of the actors, was that most of the jokes which they had to put across were already stale to them - especially during rehearsals - but as the audience rose to the jokes when put across, it was not so disheartening. On the first and third nights we had a very appreciative audience but herein lay the temptation to 'play to the gallery' by ad-libbing, a dangerous practice for young actors who are still not too sure of their lines, since one 'ad-lib' could mis-cue all cues, and the danger is always present of destroying the whole play. A certain degree of slickness was required which somehow eluded us. As a professional remarked to us later - "Amateur performances of farcical comedy generally degenerate into fiasco!" The audience was generally appreciative of our efforts and our shortcomings were relatively unrecognised. I think we can safely say that we made as good a job of it as we could. 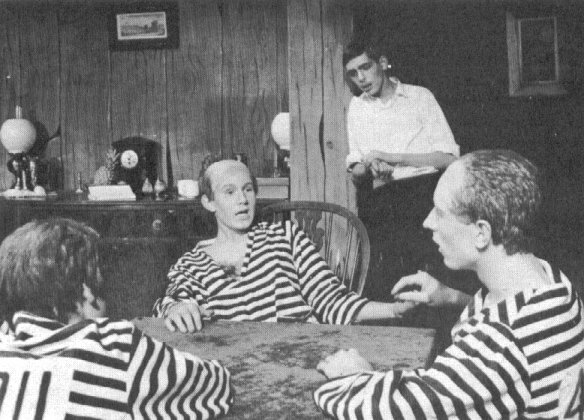 The play had its setting in a French Penal Colony at the turn of the century and the plot circulated around the introduction of the convicts sent to the town on parole labouring jobs. They find a job with a small storekeeper and his family. 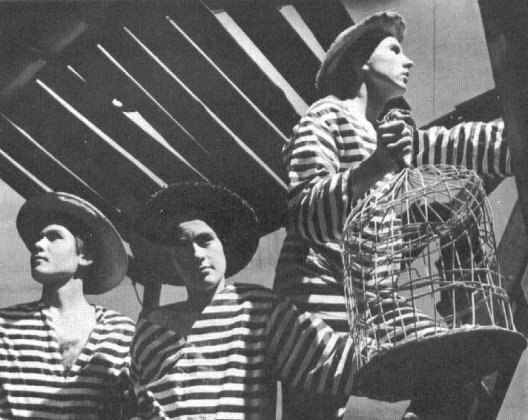 Felix Dulay, the timid storekeeper was played excellently by Edward O'Gorman, while the daughter, Marie Louise, (Mark Kolakowski) and the wife (James Staunton) Emilie gave very convincing female performances. The convicts. - Alfred (Gerald Borgeat); Jacques (Albert Welling) and Joseph (Peter Herbert) - gradually take control of the whole situation, Alfred and Jacques acting as counsellors, confidantes and servants. They all await the arrival of Uncle Gaston (David Miller) and his nephew Paul (Albert Ferry). These two characters, one to be spineless and the other utterly miserly and bad, were extremely well played. Paul is loved by Marie-Louise; Gaston is anxious to stop the affair and, by rigorous stocktaking, to discredit Felix Dulay. The convicts busy themselves trying to make a happy Christmas for the poor Dulay family by providing a large Christmas tree and an enormous turkey - both stolen from the Prison Governor - and also trying to solve the problem of Paul's waning affection for Marie-Louise. They fail dismally in these two enterprises and then resort to the unseen but unmistakably present pet snake and use its talents to solve the problems by disposing of both Gaston and Paul. The play ends on a traditional note by a fiancée being found for the heart-broken Marie-Louise; the convicts getting a personal satisfaction in putting to flight the nosey, tight-fisted Mme Parole. Concannon and Bradley played these two latter parts very well indeed. Needless there were those moments not accounted for either by producers or author - for example when a bottle of wine had to be poured and the cork went in - not out. All efforts to pour it only resulted in spurts of wine over everyone in the vicinity and gusts of laughter from the audience. On a note of gratitude to our producers who patiently bore with us, we add one to Mrs. Griffiths, our wardrobe mistress and make-up expert, who has that 'Woolworthian' capacity to produce anything from a strip of elastic to a safety pin at a moment's notice; the Stage Crew and Lighting team and to all who made it a memorable first performance of a comedy.